Never Worry About Your Job Security Again. 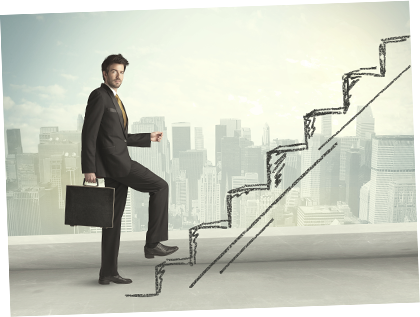 Soar to the Top of the Ladder Faster than Your Coworkers and Get More Raises, Recognition, and Respect. Stop losing sleep over cutbacks and layoffs, and start looking forward to more opportunities, better promotions, and faster career advancement. All while you easily become one of the most valued people in your entire organization. Have you been stressed out, worried, or struggling to get ahead? Have you been passed over for promotions, or missed out on raises? Does it seem like they just don’t appreciate you? Do you ever lay awake at night wondering if you will have a job next week? Do you ever ask yourself why you don’t have the level of success you feel you should or could in your life and on the job? Would you like to stop worrying about layoffs and start thinking about promotions? 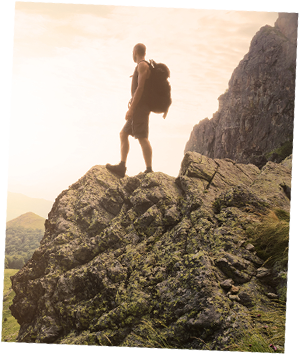 Would you like to start moving forward in your career and begin to reach the goals you know you are capable of reaching but simply have never been able to? Do you believe that job security simply does not exist anymore? Do you feel that if you continue doing things in your life and on the job the way you have always done them that you will continue to get the same results you have always gotten? If you are like most of us I am sure you answered yes to most, if not all, of these questions. This is exactly why I wrote “Defy Mediocrity. Choose to be uncommon. Think of the alternative.”. This book was written specifically to help give you the tools you need to become the best you can in your career and in life. This is a book about the pursuit of individual excellence! Mediocrity manifests itself in many ways. It cannot simply be turned on and off. It is a silent killer of careers and dreams. Chances are your self-defeating traits are holding you back on the job and in your life! They are self-inflicted road blocks you are putting in front of yourself. Road blocks that will stop you from ever reaching the professional and personal heights you could and should reach. “Defy Mediocrity. Choose to be uncommon. Think of the alternative.” will show you how to eliminate these road blocks and how easy it is to become the best you can be. I chose to DEFY MEDIOCRITY! I was given new opportunities. I was promoted to a high level executive position for a $4-billion-dollar financial institution. I handled my company’s largest and most important accounts. I was given the opportunity to take over full operations of a multi-million-dollar company, without a college degree. And so much more, simply because I rose above the crowd by defying mediocrity. Now I want to help others achieve this same type of success. This is why I wrote “Defy Mediocrity”. I wrote this book specifically to help give you the exact tools I’ve used to achieve my success. So YOU can become the best in your career and in your life. And now this is so easy! You do not have to study for weeks on end, enroll in a course, or attend seminars. Your peers, managers, boss or whoever you serve will see these changes in you almost overnight. Whether you are starting the first day of your first job or whether you have been in the work force for most of your life, this book will give you the tools you need to defy mediocrity and reach your true potential on the job and in life. Where you are and where you have been is not the issue. Where you want to go and who you want to become is. Once you take the simple steps required to defeat mediocrity on-the-job, your attitude, commitment, and quest for constant improvement will carry over to every area of your life. It really is this simple! This book will show you how. Getting up every morning with an excitement about the day instead of anxiety. Have the pleasure of feeling real job security and true appreciation for your work. Coming home every day without a load on your mind and fully ready to enjoy your personal life be it a mate, family, children, or leisure activity. Going to bed every night without having to worry about your job. Getting a paycheck that makes you smile and knowing it is only going to get BIGGER! Speaking as an employer, an employee, a co-worker, and a customer, I can say without hesitation that mediocrity surrounds us. It has become an epidemic. It is a disease that is destroying the ability of every company in this country to be competitive. It is a condition that is preventing so very many from ever scratching the surface of who and what they can become and accomplish. It can affect every one of us if we do not fight against it every day. It can hurt our careers and our life. It limits our potential. It holds us back. It is keeping you down. It is holding you back. It is stopping you from even beginning to approach the potential you have within you. Think about this. The average person’s IQ is around 100. An IQ of over 160 qualifies you as a genius. Imagine that. A genius is only 60% smarter, according to the experts, than the average person. In other words, if you can read this a genius could not possibly be even twice as smart as you are. So how can so many accomplish so much more than others? The simple answer can be found in this book. What if you could start making 10% more annually today? For example if you make $50,000 a year that would be $5,000 more in your pocket. If you make $100,000 a year that would be $10,000 more dollars you would have. What could you do with 5 or 10 thousand more dollars this year? So if this information is worth thousands if not tens or hundreds of thousands of dollars to you what would be a fair price to me? A $1,000 would be a tiny drop of what you will benefit. But I am not asking you to share even a small fraction of the raises you get because of me! How the fear of what others may think of you is holding you back in life and how to end this once and for all. How to become a "can do" and "does it" person, not a "can't do", "can't be counted on", or "doesn't do it" person. How to free yourself from the shackles of your mind. Learn how to think beyond the known boundaries and find new and far better ways to do the same thing. How the seeds of dissatisfaction will produce a harvest of change in your life. Why you might be making your employer sick. Why can others succeed and not you? The answer may surprise you. How not to let your ego get in the way of the objective. How to find the opportunity that lies within every problem. Why despite the fact that mediocrity does, indeed, love company you must have the guts to be different. How we all seek acceptance in life but the question is "at what price?". A message for those of you in management or who hope to be in management one day soon. How you possess the greatest power ever created. You own it, free and clear. To solve all your problems, to reach all your goals, all you need to do is put it to work. It sits and waits for you to use it. Why can someone else accomplish that and not you? Says who? How to change your life by looking for responsibility. What to do when you get discouraged. We all do! Discover and defeat the enemy within. “Your book should be a substitute for the bible! Your wisdom and knowledge is extremely helpful, inspiring, and encouraging. 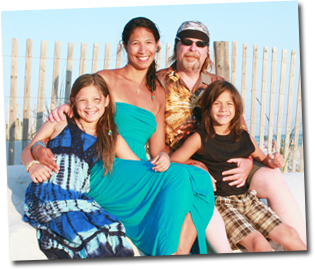 If you are a business owner or manager, how much money are your employees costing you? Frank Bunker East Coast Sales Manager, Walker-Clay, Inc.
“Defy Mediocrity: Chose to be uncommon. 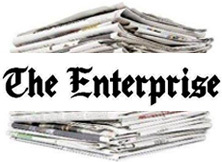 Think of the Alternative” will provide the wakeup call your employees need. Your employees are perhaps your most important asset. If you are like most companies, they also represent the single largest expense your company has. Unfortunately, employees in most companies are simply not performing as well as they could be or should be. If you are a business owner or manager, underperforming employees limit your ability to be competitive. They drain productivity. They can seriously hurt morale. They have a direct and negative impact on the profitability of your organization. Yes, your employees are probably your largest cost and among your largest headaches. But your employees are also the one thing that can provide you with the largest gains for the lowest cost. To defeat apathy, procrastination, the attitude of entitlement, absenteeism, low productivity, poor quality, complacency and dozens of other negative traits is to “Defy Mediocrity”. This book will remind your employees of why they were hired, of what their job is, of how their efforts impact the company. Show them why their efforts and contributions must come before the rewards and promotions. Help create support for management. Provide the motivation they need and may not be getting. Get them to start looking out for the company instead of themselves. Show your employees how to improve their value to the company and why it benefits them to do so. Teach them what it takes to excel. Teach them how easy it is to become an impact employee. Show them the importance of integrity and pride. Make them want to start taking responsibility for their actions and inactions. Show them how their ideas, and not just their efforts, can dramatically impact the company in a positive manner. Make them want to solve problems, not just point out every one they see. Show them why what they do is so much more important than what they say. Show them the importance of embracing change and helping to make it succeed. Show them the critical importance of internal customer service and how it can make their job so much more productive and enjoyable. Show them why the company must come first. “Defy Mediocrity: Choose to be uncommon. Think of the Alternative.” will teach them all this and much more while showing them why and how it benefits them to think and act this way. An employee driven to excel can make an astounding impact on the productivity, morale, quality, and service of your company. All of which lead to dramatically increased productivity, quality and profits. Shouldn’t you put a copy in the hands of each employee today? A fair question. After all, you should want to know what qualifies me to write this book. Having spent over 3 decades in senior management positions with both large and small companies I am not someone who has read about what to do, or has only told others what to do. I am not an MBA or Ph.D. and while I do have degrees in Business Administration, Marketing, and Management, textbooks and classrooms have not taught me how to dramatically increase the productivity and profitability of any business. Most of what I have learned has been through trial and error. I have worked on the production floor and in the boardroom. I have helped run very successful companies and I have turned around companies that had been bleeding red. I have started at the bottom and worked my way up. This book will show you the same strategies I used to help me become Vice President of a major Boston based Advertising Agency at the age of 27 and Chief Operating Officer / Vice President of Operations of a nationwide multi-million-dollar company at the ripe old age of 31. As I have told you before, few things are more valuable to an employer than a manager or employee whose ideas and efforts help dramatically improve the company. This book will show you how. 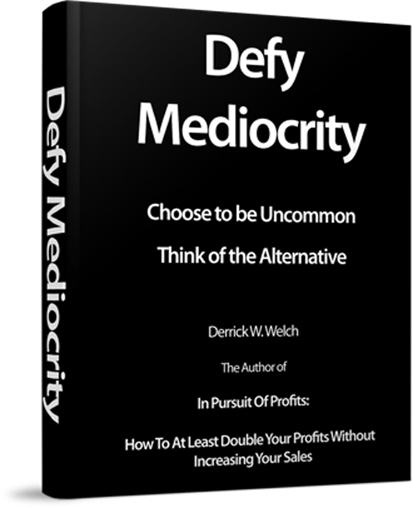 I hope you will join owners, executives, managers, and employees from the very long list of companies, public and private, for profit and non profit, from small businesses to Fortune 500 companies, from virtually every industry who are using the knowledge and strategies contained in “Defy Mediocrity: Choose to be uncommon. Think of the Alternative” to dramatically improve their job stability, career path and life. Anthony McKee , President, Southern Office Supply, Inc. 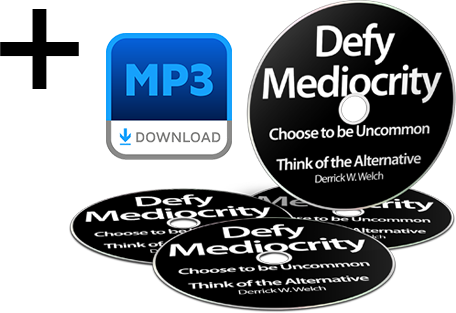 Please for your sake, your employer’s benefit, and your friends and family, order Defy Mediocrity right now. Your life could be different starting tomorrow! I know from personal experience that you could lose out on a promotion, raise, new job, or other opportunity at any moment. ‘Defy Mediocrity’ could prevent that. Why not avoid the pain and suffering that could be headed your way and get what you deserve happening instead? I am so convinced that DEFY MEDIOCRITY will change your life by putting your career on the fast track I will give every penny of your money back if you are not jumping for joy after trying my principles. So let’s go. Let me start helping you right now! ORDER TODAY & GET THE COMPLETE AUDIO VERSION FREE! 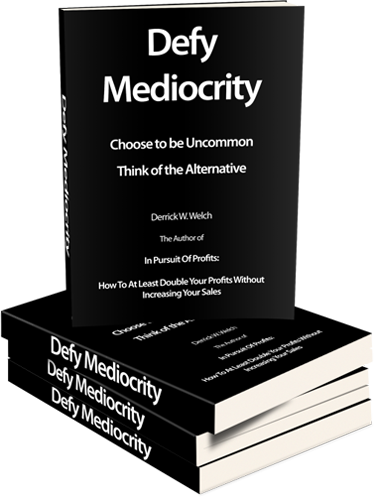 "If you are interested in dramatically improving the operations and profitability of your company, your job stability, or the direction of your career read "Defy Mediocrity" by Derrick Welch. Owners, executives, managers, and employees from companies, both large and small, from virtually every industry are using these books including In Pursuit of Profits: How to at least double your profits without increasing your sales, to improve their skills and the operations of their organization."